Although leasing a car may be a suitable option for new buyers, it is extremely important for people to know that there are some basic rules and regulations that apply to the leasing procedure. 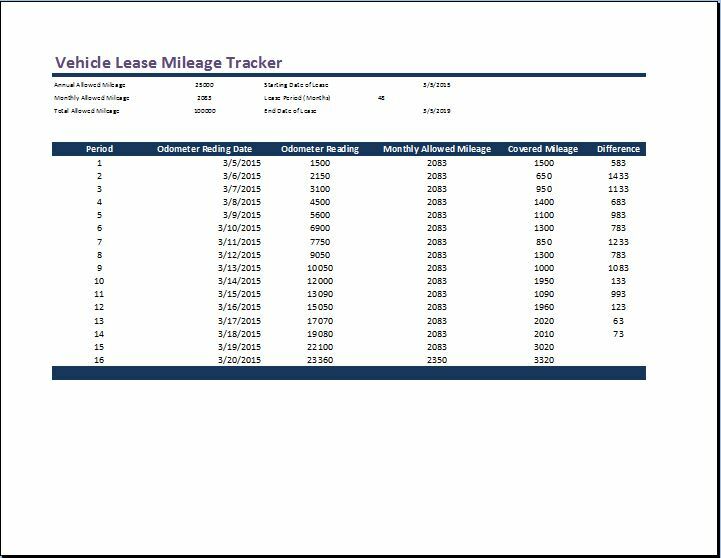 For people, who find it difficult to understand or remember these rules, a vehicle lease mileage tracker can be a wonderful solution. Vehicle lease Mileage tracker ensures that people who have leased their vehicles should stay informed regarding their leasing guidelines. It is a great tool which removes the hassle and trouble of excessive paperwork and formalities during the leasing procedure. This unique template is so helpful that it not only helps in compiling useful information using a single system but removes the need for you to mess up your mind over tedious work related to the leasing process. The lease Mileage tracker is extremely effective. You just need to enter some basic info such as mileage which is permitted per year; lease beginning date, lease period numbers and monthly readings and the rest of the work being done by the template. 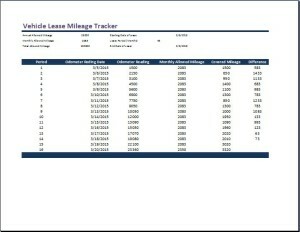 The Excel lease mileage tracker spreadsheet will automatically assess how many miles you need to cover per month. It will also compare your driven miles with miles permitted to provide you with an accurate data for your vehicle needs.This is a wonderful tool for people who are looking forward to leasing a car. Its ability to calculate your driven miles along with an accurate comparison to all your data makes it a must have application for your vehicle data tracker needs.